This intra-day view is showing a clearly established downtrend targeting 7500 on the Dow. This is an initial target, subject to change as prices come down. In summary, everything I am looking at through an Elliott Wave structural perspective is saying that this decline is going to extend an immediate 500 Dow points and eventually as much as 3,000 Dow points. If something else is happening, it's not showing up yet on my charts, so for me at least, I'm going to stick with what has brought me this far, a simple application of some major tenants of The Elliott Wave Principle. If it ain't broke, don't fix it. While the perma-bulls are soiling their pants in excitement over this rally, I remain unimpressed. Annotated on this chart is the 943.85 price high of January 5, 2009. 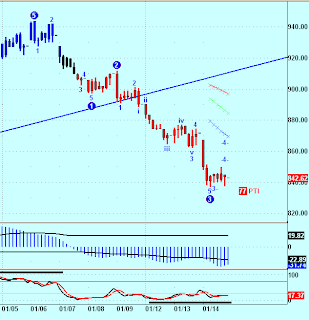 The move down from 943.85 to 804.30 on January 19th counts as Wave 1 DOWN of a larger Wave 5 DOWN from the highs of October, 2007 (see blue circle 5 upper left of chart). This is not the only wave count, nor is it necessarily the right one, it's just the one that makes the most sense to me. 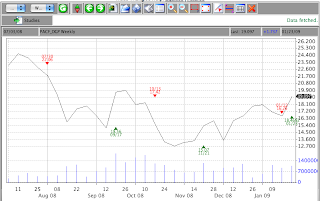 The last bar on this chart is for the current week and it is retracing a percentage of the entire January decline. 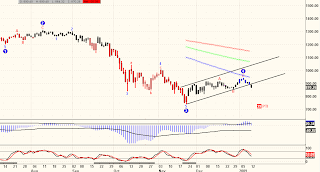 Under orthodox Elliott Rules, this Wave 2-Up can retrace up to 100% (and no more) of Wave 1. 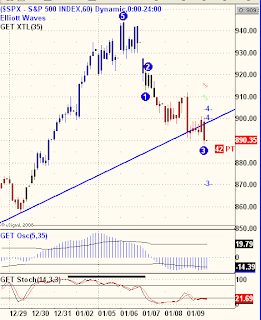 That is the significance of the 943.85 level. If it gets taken out to the upside, this Wave Count is wrong. Levels discussed by other readers representing 38-50-61% levels of Wave 1 are all premises of the extent of this Wave 2-Up and are worth keeping sight of in the next few days. The high print today was 877.86, a near-perfect 50% retracement of Wave 1 DOWN. We know that upon completion of Wave 2-Up, that the next move is a Wave 3 DOWN and it promises to be hard and sharply DOWN, as all Wave 3 DOWNS are usually the worst, most fearful of all waves under the Elliott Wave Principle. That it may be occurring on a Weekly Count will serve to make it all the more severe. So there you have it, possible 70 more points to the upside for the SPX, against the expectation for a violent decline that could start at any time targeting a loss of 200 or more quick and dirty points on the downside. Anyone else have that album? It was my first S&G album, circa 1965. Bleecker Street, Sparrow, an acoustic Sounds of Silence. What a spiritual awakening that music triggered and it's still with me today. Nonetheless, this morning's stock market rally is within parameters of my EW bearish scenario, so I am not chasing and in fact, even more resolute that the ultimate resolution of prices will be hard down in the weeks ahead. The Elliott Wave Principle differentiates between, "Impulsive" and "Corrective" Waves, the former is in the direction of the main trend, the latter is generally against the main trend or sideways. Below is a 30-minute line chart of the SPX, showing the closing prices of 30 minute intervals. 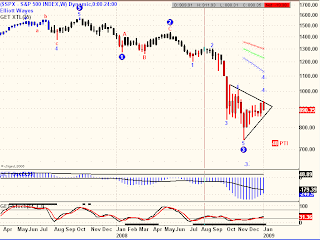 Note that under this chart, the market is in a smaller time frame Wave 4 Corrective phase. 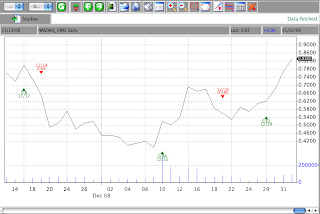 As you can see, all the action from the January 16th High has been sideways, thus Corrective, in nature. We saw the same pattern earlier this month on a larger time frame, the Daily chart, a pattern that was resolved to the downside. Most of my charts, including this one, include an indicator named, "False Bar Stochastic." I prefer not to use many indicators (they are one step removed from price action), but in the case of the FBS, it is too effective not to have on every chart in every time frame. Accordingly, the market is set up to fall out of the drawn wedge on the chart, probably in another impulsive wave down to new lows for the move. No guarantee, just a probability that the next major move is DOWN. The Elliott Wave Financial Forecast recorded an 18.5% gain over the past 12 months, and is the second-best performer over the past year (of the newsletters covered by Hulbert), all while (again, according to Hulbert) taking on less risk than the broad market. And right now, they're making a special offer available to readers that coincides with today's release of the latest issue of the Financial Forecast's sister publication, Robert Prechter's Elliott Wave Theorist. This offer is only good for a few days, but right now you'll get a special low price on a three-month subscription -- save 45% off the regular price -- plus get a free copy of Bob Prechter's updated Conquer the Crash. This new January 2009 Theorist is more than a must-read issue; it's one of the most profound and important of Prechter’s career. Of course, as with all the offers at Elliott Wave, they have a 100% satisfaction guarantee to go along with your order, you can read all the details here. 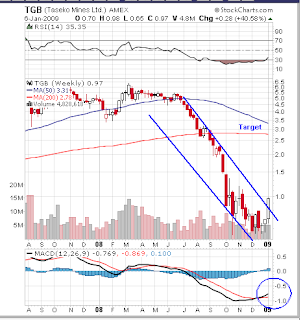 In my January 17 post, "Readers' Choice," my forecasted price target was 0.24 to 0.32 for ACTC. 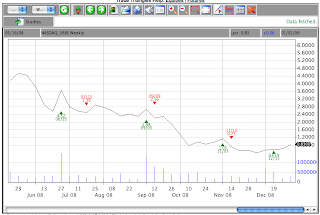 It has reached 0.255 so far today and my daily chart has generated new price targets, 0.55 to 0.60. One of my picks from my New Year's post, Two-thousand and nine predictions, was Gold. As we near the end of the first month of 2009, let's take another look at Gold. 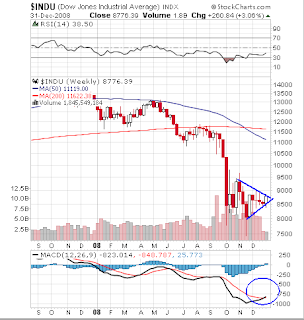 Here is a Weekly Triangle chart on Gold. 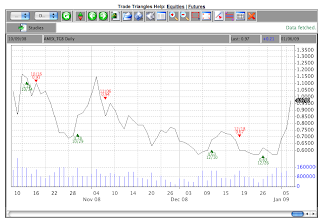 As you can see, the Buy Triangle from November of last year was reversed on the January 12th Sell Triangle. 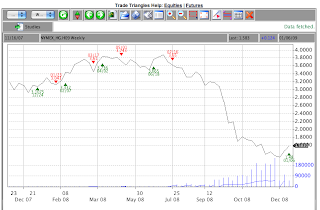 That short-lived Sell was just this week reversed to a Buy with a brand new Buy Triangle. If you haven't figured it out by now, a Triangle that results in a loss is often followed by a very profitable Triangle as the major trend is re-asserting itself. That appears to be what is happening in Gold. In summary, from a bullish set-up at the top of the year, Gold faltered a bit, mid-month, but has come roaring back with contemporaneous Buy signals from independent charting techniques. Thus, Gold is telling us to take notice of this chart strength and to disregard (for now) the blip lower earlier in the month. DGP will effectively capture about twice the percentage move up that is being signaled by these Buy signals and may very well be the best core position for playing the upside. 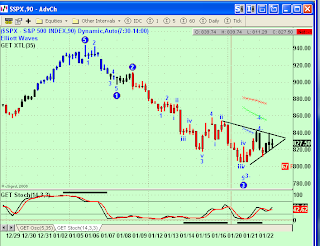 Not shown on the chart are Wave 5 projections between $0.90 and $1.00, almost a double from current prices. Click on the link above ("Capital Gold") to go to their web site and examine the fundamentals, which appear to be outstanding and certainly much improved since this stock sold for $2.00 a share in 1999. 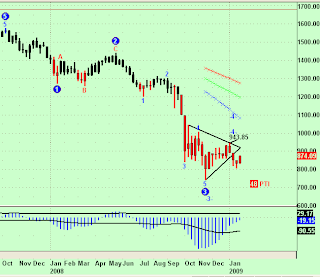 If gold is on any kind of sustained run here, CGLD has the potential to be a multiple bagger. Having posted earlier this past weekend highlighting three speculative Longs for consideration, it's only fair to warn all that I believe that there is an imminent market collapse in the works. 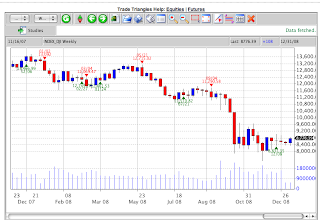 Here is the Weekly chart of the DJIA. Lets not make this anymore complicated then it has to be. The prices have broken down out of a wedge, or triangle, or bear market rally and that is the suggested Wave 4 of a five wave sequence down. According to typical Wave 5 measurements from the end of Wave 4, this next down leg will result in a descent to between 6,000 and 3,500, basis the DJIA. This is not something to fear, this is something to to exploit by riding the trend as far down as it goes, with any instrument of your choosing. As I stated in an earlier blog, this next leg down will be followed by a powerful rally, a bull market of historic proportions. It will probably only be a second wave to be followed by more mayhem, but we can plan for that if and when this next leg culminates as now expected. Many of my readers have sent me private correspondence highlighting special situation stocks they are excited about and have asked me to render an opinion. I've picked three of the best ideas and am publishing them here for all to see and evaluate. 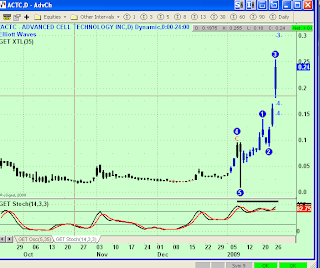 ACTC was a $6.00 stock back in 2005 based on the inherent potential in regenerative medicine. The emerging field of treatment called “regenerative medicine” or “cell therapy” refers to treatments that are founded on the concept of producing new cells to replace malfunctioning or damaged cells as a vehicle to treat disease and injury. Our focus is the development of effective methods to generate replacement cells from stem cells. The fundamental play here is for the new Obama administration to reverse the anti-science polices of the former administration and to have federal programs work with cutting edge biotechnology companies in tackling our most deadly diseases. 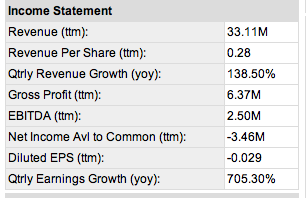 Look at it this way, if ACTC goes back up to 1/10 its highest valuation, it a six-bagger from current levels. Brother, can you spare a dime? 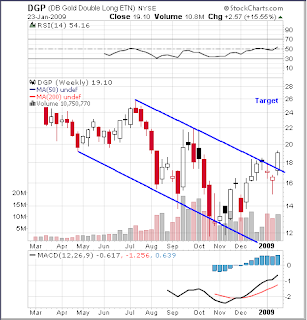 DPDW was over $2 a share as recently as 2007, now struggling to break out above 20 cents. 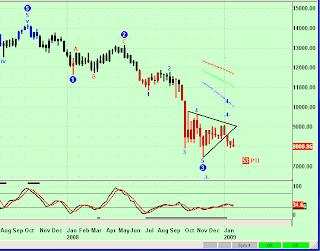 The Daily chart shows a completed 5 wave pattern down to recent lows. So some kind of bounce is due, maybe even a new bull market. An easy double or triple in any kind of extended rally. I like to start these off with a really blockbuster fundamental, but, in the case of CSIQ, every damn one of these numbers is blockbuster. This is a $5 stock, down from over $50 in 2008, with $3 a share in cash, 2020% quarterly earnings growth and $10 book value. The Daily chart is showing a completed 5 waves down with the False Bar Stochastic working its way into a Buy signal, but not quite there yet. The fundamentals here support the stock price appreciating 2,3,4 fold from current prices and still an argument could be made that's its undervalued. This is a good one to hitch your wagon to in case the market goes up any time in our respective lifetimes. P&D stands for, "Pump and Dump." "Pump and dump" is a form of microcap fraud that involves artificially inflating the price of a stock through false and misleading positive statements, in order to sell the cheaply purchased stock at a higher price. Once the operators of the scheme "dump" their overvalued shares, the price falls and investors lose their money. Stocks that are the subject of pump-and-dump schemes are sometimes called "chop stocks." While fraudsters in the past relied on cold calls, the Internet now offers a cheaper and easier way of reaching large numbers of potential investors. 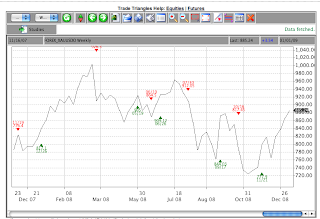 (2) In order to sell the cheaply purchased stock at a higher price. 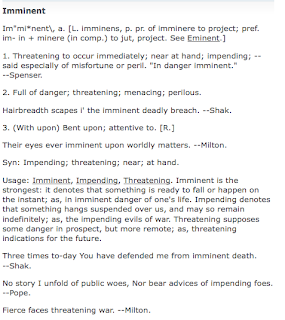 Unless both elements are present, there is no "pump and dump" only slander per se (per se because I am an attorney). 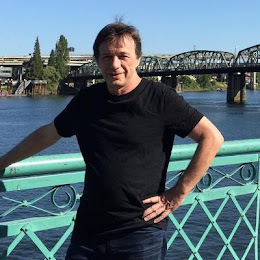 The fact is, I still own every stock I mentioned in this blog this year and I also have had a huge short position on, so I could withstand a little drawdown on those longs, while cleaning up on those shorts. As for the poster or anyone else seeking personalized trading advice, call Cramer. I'm here to share my ideas, not to give advice. On a brighter note, my readership has grown exponentially in the past six months and I continue to get welcome appreciation of so many of you, through emails, donations and positive comments. Those of you with your heads on straight should take away from this Blog a wealth of insight and newly found skills in trading your own accounts. Clearly, that is representative of the vast majority of my readers and I hope that I continue to be worthy of your praise and support as this year rolls on. Be forewarned that there is a major low coming and we will all spend much of 2009 building wealth on the Long side of the investment arena. We just aren't there quite yet. So be prepared for the ride of a lifetime, but only when the market says, "Buy, buy, buy." Here is an updated Weekly S&P chart, including Wednesday's dive as well as the extension lower due to the sad but market moving news about Steve Jobs. I've added a potential support level that was automatically generated by my software, based on typical lengths of waves under the Elliott Wave Principle. 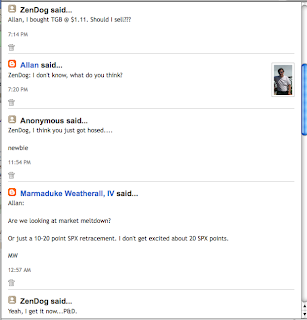 Yes, that says 700 on the S&P 500. Above is the Daily S&P chart with an added first support projection indicated to be about 650. 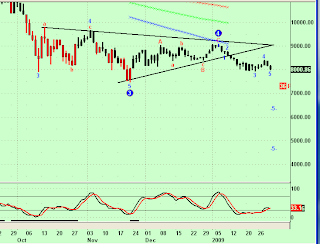 Worse yet, the minimum projection for the end of this five-wave decline is indicated to be just below the 600 level. 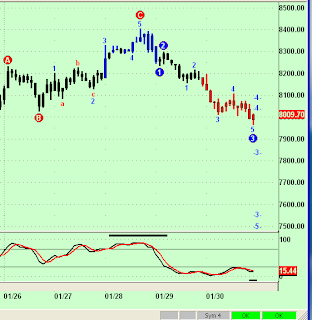 This is the Sixty minute chart, showing the shorter-term waves division. Consistent with the Daily and Weekly charts, this shorter term snapshot shows how the larger waves in the above charts are breaking down in a fractal of the major count and how since breaking the bottom of the Wave 4 channel shown in the other charts, that prices have been accelerating down. 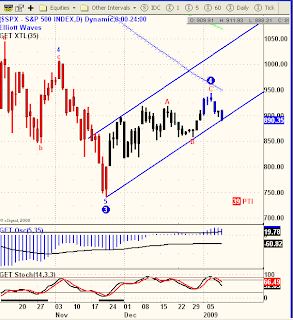 The above Weekly chart shows a clear break of the ten week long wedge that appears to be a completed Wave 4. This is a good time to remember that anything can happen in the markets and be explained away in retrospect. Nonetheless, if it looks like a break-down, acts like a break-down and feels like a break-down, it's probably going a lot lower. 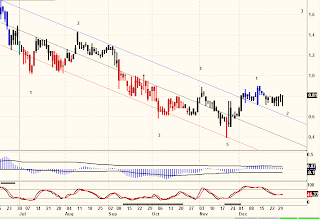 This is an almost perfectly formed and complete Wave 4 with a break of the channel lines drawn from the November lows. My analysis tonight is purposely succinct, not just because it's been a long day and the Red Wings lost to the Dallas Stars in overtime, but because sometimes less is best. Let's not make this Elliott Wave stuff any more involved then necessary. We are still due another leg down to complete the first phase of a multi-year bear market and as of tonight, the most apparent chart action is suggesting that Wave 5 down has begun. Three updated charts of the S&P 500 index as of Friday's close. 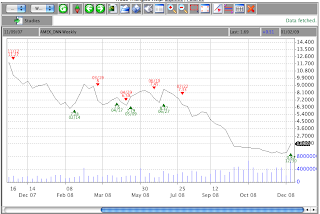 In descending order, the Weekly, the Daily and a 60 minute chart. The chart above is our main compass, a Weekly S&P 500 chart that is in the midst of a five wave sequence down from the 2007 highs. There are three clearly designated completed waves and by implication, a Wave 4 that has been sliding and slinking its way sideways to up against the major downtrend. A previously drawn wedge is placed earmarking this 4th Wave with the hope of isolating either an extended Wave 4 by a break upwards out of the wedge, or a completed Wave 4 by a breakdown below the wedge. As is obvious, neither an up or down breakout has yet occurred. By zeroing in on a couple shorter time frames, maybe we can glean some clues as to which way prices are headed. 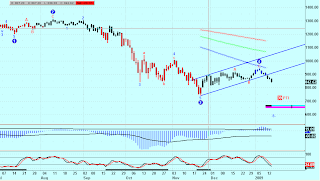 Above is a Daily chart with a broader view of the 4th Wave. I've drawn in a channel that encompasses all price action since the November 21, 2008 low. Superimposed on that price action is a simple ABC sequence culminating with a Wave 4 top as of the close on Tuesday, January 6, 2009. What isn't clear on this chart is whether or not Friday's decline broke the bottom of that upward rising channel. For some clarity, let's look at the 60 minute chart below. Whoa, Nellie (not an orthodox Elliott observation), this chart shows a break of that lower trend line clear as a bell. The phrase means simply "very clear." A bell is used as a model of clarity because the sound of a bell ringing is a clear tone. In the realm of sound, the opposite of clear is dull. 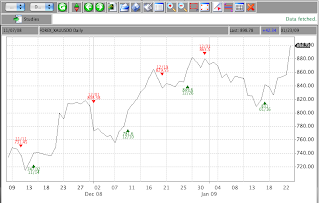 The smaller time frame provides a snapshot of all the price action for the first six trading days of the new year. A top of some significance is shown being made on Tuesday, January 6th. Beginning Wednesday and carrying into the close on Friday, prices moved down in what is being shown as a five wave sequence. 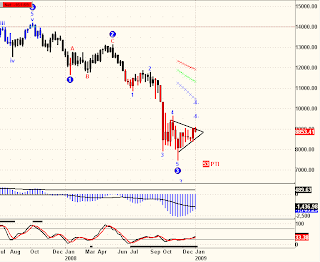 This is where my analysis deviates from more traditional Elliott Wave analysts. 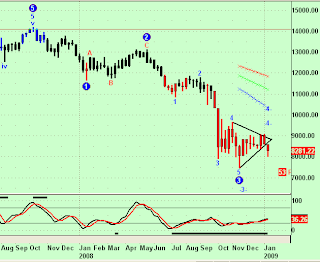 You will read elsewhere how this Wave 4 is tracing out a triangle or a flat or a double flat or a zig-zag or any number of traditional Elliott Wave corrective patterns. These are all well and good and I admire those who can figure that stuff out. But just as I avoid getting clogged up in the minutia of life, I also abhor getting involved with all the subtle, yet ambiguous minutia of the Elliott Wave Principle. If I can't trade it, what good is it? The analysis above is one I can trade. I know that the elusive Wave 5 to new lows will start with a break of that trendline in all of the above charts. That doesn't mean all breaks of that trendline must result in a Wave 5, only that a break below support will provide the first tangible indication that Wave 4 is over and Wave 5 has begun. If prices correct back above the trendline, my analysis is probably wrong and I am exiting with a small loss. If prices continue lower, I clean up with my short positions. In fact, if I short every break of that trendline I am certain to enter Wave 5 early enough to profit handsomely, including those small losses incurred, if any, upon those false breaks. 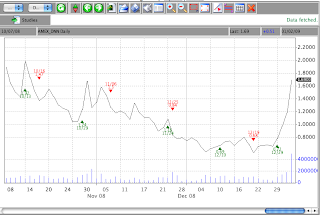 Like it or not this is how I trade EW. Keep it simple, with an emphasis on clarity, while being true to the major tenants of the Elliott Wave Principle. 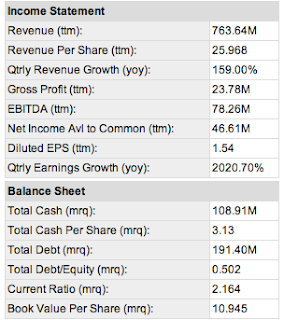 It may not be perfect textbook Elliott, but it is profitable. I'll take profits over perfection, every time. 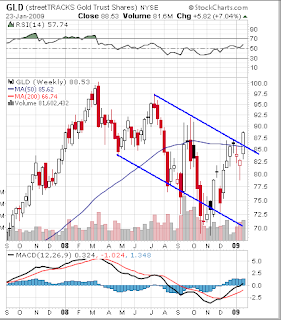 No change in chart analysis as new weekly bar has not clearly broken out of wedge pattern. The longer it takes to break upward, the less likely it will. Any breakdown from here will suggest a wicked decline, taking all the new bulls out for the count. First, on the markets: This Wave 4 rally from the November lows is getting long in the tooth. I have no idea what that means. All my teeth are about equal in length, at least that part of them that I can measure above my gums. to be very old. Don't you think she's a bit long in the tooth to be a romantic heroine? Note a few important features of this chart. The Breakout, of course. The MACD Buy cross-over, naturally. But look at the moving averages, about half way up the entire decline. A typical retracement of 50% here is a triple, +200%. TGB was a $6 stock a year ago. Today TGB closed at 0.97. On the Weekly Breakout chart, if TGB just goes to it's 50 or 200 day moving averages, it a triple bagger, +200%. If it runs to it's 52 week highs, it's up 500%. Copper is breaking out, currently about $1.58, it is cheap by historical measures, 1/3 of where it was one year ago. 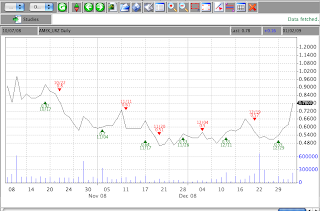 TGB is breaking out, all reward measurements are up in the 200%+ range. When copper was $3.50, TGB was $6. Along with copper, TGB is sitting on millions of ounces of gold. My valuations are based on copper only, the gold is thrown in to boot. also. She said she liked living at home, and she was saving money to boot. Armageddon hit the uranium sector back in 2007, culminating in selling climaxes in the Autumn 2008 market crash where individual uranium stocks fell as much as 99% in price. Where there is carnage, there is opportunity. Last week many uranium mining stocks popped anywhere from 15-50%. Bear market rally or start of a new bull market in uranium sector? Worst case, a bear market rally with gains in the triple digits from current levels. Best case? According to Jim Dines, these stocks are destined to revisit their 2007 highs. That would mean gains well over 1000% for many of the small cap uranium's. Thus we have a trading premise that these stocks are in rally mode, short-term projections of 100% or more and if this rally is indeed the start of a climb to new highs, then projections exceed 1000% from current prices. 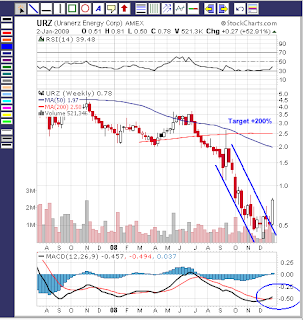 Here are three sets of charts, three each set for URRE, DNN, and URZ, all small cap uranium sector stocks, all down over 95% from their 2007 highs and all which have a minimum short term projection exceeding 200% higher from current levels. If the 2007 highs in these stocks are revisited, gains can be anywhere from 600% to 1700%. By now all readers should be familiar with the format, meaning and use of these three chart templates. First chart is a Weekly Triangle analysis, second chart style is the Daily Triangle analysis and the third chart style for each stock is a more traditional bar chart with a breakout of longer-term trend channel and TA-based targets from current prices. Finally, a recent article from Time, Nuclear's Comeback, presents the case for renewed interest in nuclear energy as a longer term answer for future energy needs. It's nice that there is a confirmatory fundamental argument to account for the coming-to-life of this sector, but as I hope you have come to realize by now, the charts tell all. I don't usually like to use canned videos from others on this blog, preferring instead to err on the side of original thought. Nonetheless, Market Club has just released this 5 minute video on how to use the Triangles for quick and easy "in the moment" trade selection. This is an excellent video, one of the better tutorials they have produced. One of the key components I look for is how a market closes on a Friday or the last trading day of the week. This is when traders have to decide what they want to do with their positions. 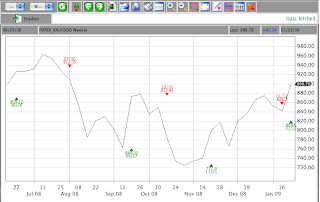 It also tells you with a high degree of probability which way the market is headed for the upcoming week. I learned this trading secret on the floor of the exchange in Chicago and it is one I would like to share with you today. I feel that this technique has a lot of validity, particularly in light of today's volatile markets. Back to my usual home spun wisdom, observations and clarity on the markets, shortly. The last six weeks of 2008 saw the DJIA creep sideways in what appears to be a wedge formation, suggesting that in the first week or two of January the market will either break up out of the wedge and carry all the way to 10000, or conversely break down out of the wedge with an initial target of 7000. Despite the apparently conflicting nature of this analysis, it does provide a road map for the next couple of months, based upon the market's behavior over the next two or three weeks. 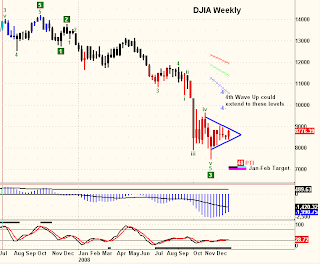 Staying focused on the DJIA, the Triangles on the weekly chart are barely clinging to a Buy signal from three weeks ago. 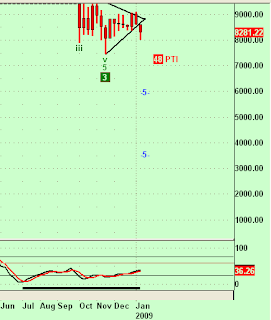 A hard break of the 8400 level will likely trigger a Sell signal. Thus on both the EW chart and the Triangle chart, any significant weakness directly ahead will likely generate a tradable decline to new 52 week lows. Note how on the above chart the same wedge appears while the MACD seems to be making a bullish crossover, suggesting a move upward toward the declining moving averages, again at about 10,000-11,000 basis the DJIA. 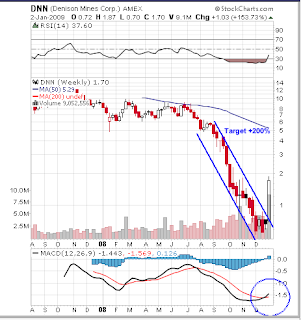 Any decline now, one that nullifies the bullish crossover, would trigger a very bearish "hook" on the weekly MACD. Enough with the ambiguity? Sometimes that's all the market offers and now is one of those times. But it can't hold it's cards indefinetly, the next significant move is one that can followed with some confidence, whether up or down. 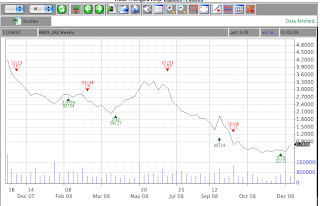 During calendar year 2008, NNVC rose 100% from 0.40 to 0.81 at year end. That included a trip up to the 1.78 level mid-year, a drop back to the 0.40 level late in the year and a year end rally back up to close the year at 0.81. 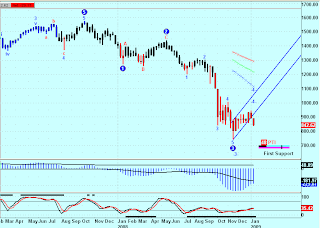 The chart below shows the journey on a daily chart with my own EW wave count superimposed. If I am right and NNVC is about ready to blast off in a wave 3 rally, last year's 100% raise will seem like chicken feed. Chicken feed? Is that some kind of allusion to bird flu? You betcha. Here's a link to a daily news feed on Avian Flu cases as they are reported from around the globe. This is scary stuff and Southeast Asia seems to be on the cusp of massive bird flu breakouts. 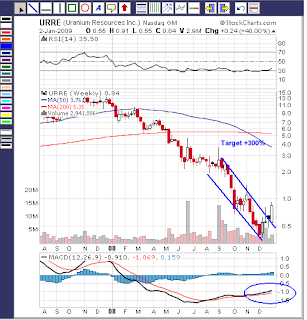 Last time that happened NNVC was put on the map, rising from 8 cents to 3.75, just on bird flu speculation. In the three years since, NNVC has continued to cultivate its "hit list" of viruses subject to eradication through NNVC's targeted anti-viral therapeutics. NanoViricides, Inc. is a development stage company. The Company's novel nanoviricide™ class of drug candidates are designed to specifically attack enveloped virus particles and to dismantle them. The Company is developing drugs against a number of viral diseases including H5N1 bird flu, seasonal influenza, HIV, Epidemic Kerato-Conjunctivitis (EKC), hepatitis C, rabies, dengue fever, and Ebola virus, among others. In a year when the major market averages dropped 40%, NNVC rose 100%. NanoViricides is three years further ahead in their development from when sheer speculation alone triggered a rise of over 4,000% in market cap and share price. A similar rise from current levels would lead to a share price of over $32/share. Factor in all the other targeted viral diseases and it is mind boggling what is possible here. Yea, I'm pounding the table once again on NNVC. 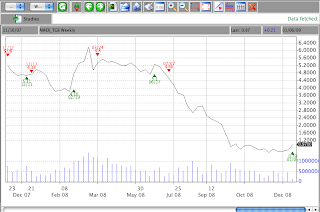 Above is a chart of the XAU Gold Mining Index. 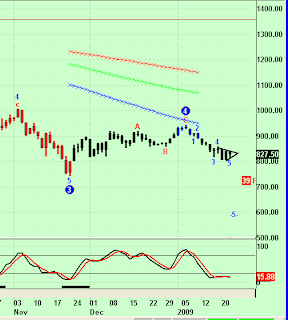 This chart bears watching very closely as superimposed upon it is an aggressive EW count suggesting that gold stocks are in the very beginning of a new bull market. 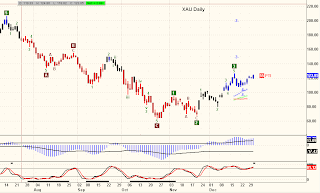 The XAU could easily double in price if this wave count is correct and then it would only be the first wave up before a consolidation leads to even more spectacular gains. Supporting the bullish XAU chart is the Triangle chart on Gold, showing a late November BUY signal followed by a robust rally. 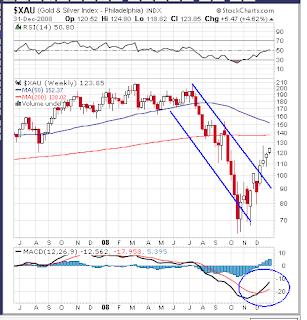 Finally, this weekly chart of XAU shows the recent strength was enough to break out above a 10 month down channel, a fresh MACD Buy cross-over and no real price resistance until over 200 on the index, a near double from current levels. The market is going to be volatile no matter what direction it goes, but a major bear market has asserted itself and until proven otherwise, that's the course of future prices. My best pick for appreciation this year is once again NNVC and it is not too late to buy this stock based on where I am suggesting it can go in the years ahead. Finally, Gold and Gold Stocks may be my next best idea if the rally from the late October lows extends on the heels of geopolitical and domestic economic cycles that are running the scary side of miserable in the current global environment.